Earlier in the year Leanne and I took a trip over to the Cook Islands and we stayed on the main island of Rarotonga for a short holiday. I had heard so much about the fishing in Cook Islands that I decided to check out what was on offer well before we left to go over there. After letting my fingers do the walking through the world of Goggle I sent off a number of emails to around four different fishing charter operators. Which of only one got back to me! That was Ali here from Akura Fishing Charters. After several emails it was decided that I would share a charter mid-week with a number of other customers. Even though it was a 9am start I was up at the crack of dawn raring to go. Upon arrival at the docks I was informed by Ali that there would only be three of us as three of their other customers had pulled out late the night before. Now, to their credit Akura Charters still took the three of us out even though they most probably wouldn't have got paid enough to cover their cost. This I can't thank them enough for as we had a great five hour session. Now you may not think that five hours on the water is long enough, but when you only have to travel approximately one kilometre offshore and the deckie (Cam) started to set the lines out the back to troll for either mahi mahi, wahoo, yellow-fin and skipjack tuna, blue and striped marlin, sailfish and spanish mackerel. Five hours is plenty of time. The particular day we went out there was a fair bit of wind blowing (about 15 knots) so the captain (George) decided that we would troll out to the first of many FAD's (Fish attracting device) that are found on this side of the island. We were trolling a combination of dead baits, soft plastics, poppers and skirted lures throughout the five lines. Two were set on the out riggers, two were on the gunnels and there was one shot-gun way out the back. 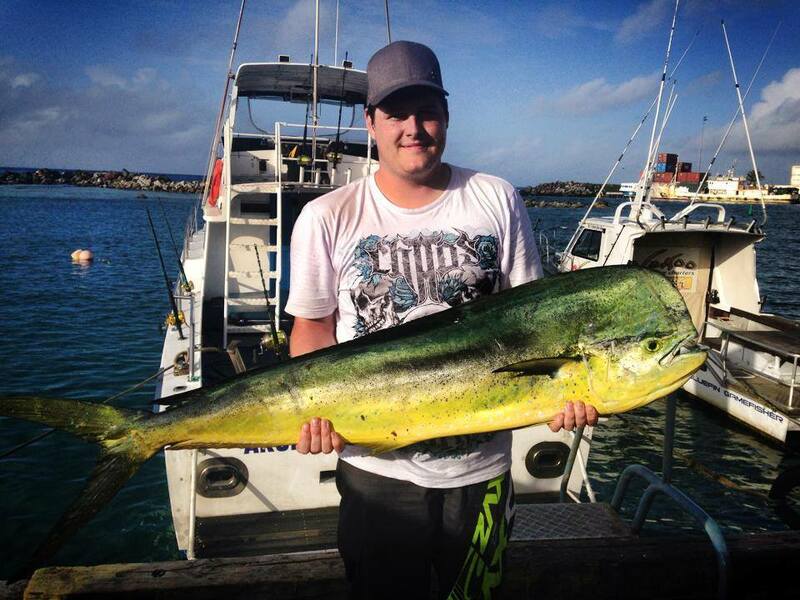 It wasn't long before I was sitting in the game chair hooked into a Mahi Mahi. After a short battle the Mahi Mahi was in the tub on ice. Cam our deckie for the day deployed the lines again and it wasn't long before we were hooked into another Mahi Mahi, but this one decided to jump all over the place and gain its freedom. This seemed to happen for the rest of the morning. Missed strikes, hooks ups, lost fish, near misses and bust offs. Oh well, that's why they call it fishing not catching. I cannot praise both George and Cam enough as the effort that they put into trying to get us on fish under pretty rough conditions was phenomenal. They both never stopped trying until we reached the entrance to the harbour. 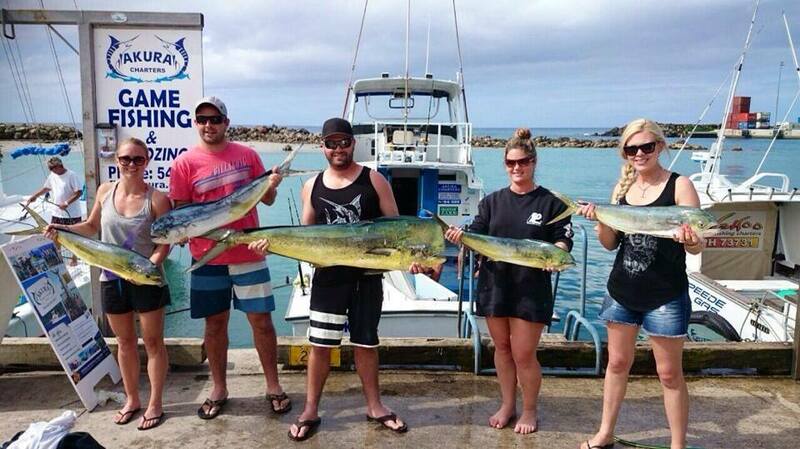 If you ever get a chance to go to Rarotonga give Ali and the crew a call or send them an email fish@akura.co.ck and book a day out on the water. While on Rarotonga we stayed at the Crown Beach Resort which is situated on the western side of the island and Leanne and I were lucky enough to have the chef at the resort cook the Mahi Mahi up for lunch. If you have never tried Mahi Mahi before you are definitely missing out. 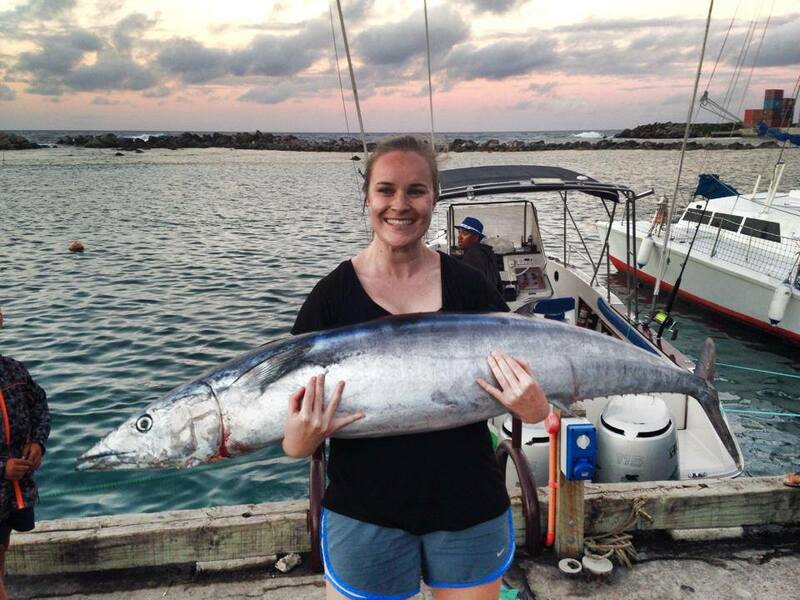 Has anyone been out on Akura Charters lately ana if so how have you gone?